The UN agency for Palestinian refugees said Monday it was temporarily withdrawing part of its foreign staff from the Gaza Strip following security concerns linked to job cuts in the Palestinian enclave. It said in a statement it had "decided to temporarily withdraw part of its international staff from Gaza following a series of worrying security incidents affecting its personnel in the strip." A source with knowledge of the situation said six foreign staffers remained out of the 19 who are usually there. The Israeli defence ministry unit that oversees the crossing said a number of foreign employees from the agency known as UNRWA "were evacuated from the Gaza Strip to Israel" on Monday. 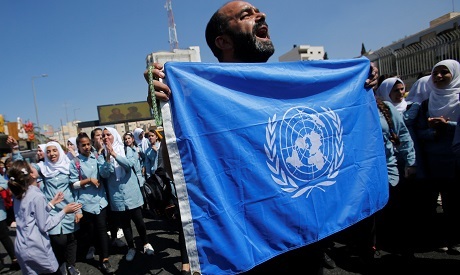 UNRWA employees in the strip have held strikes, sit-ins and other protests since the agency announced in July it was cutting more than 250 jobs in Gaza and the occupied West Bank. Hundreds of full-time roles have also become part-time. Laid-off workers warn that their families will be at serious risk in Israeli-blockaded Gaza, where unemployment is at some 53 percent. The cuts come as a result of US President Donald Trump's decision to cancel all aid to the agency. It called on the authorities in the enclave run by Islamist movement Hamas "to respond to its repeated demands to provide effective protection to its employees and facilities." "The lack of effective security and safety risk impacting vital humanitarian services to more than 1.3 million refugees in Gaza," it said. It received pledges of $118 million from donor countries last week to help it overcome the funding crisis, but still has a shortfall of $68 million in its annual budget. Created in 1949, the agency supplies aid to more than three million of the five million eligible Palestinian refugees in Jordan, Lebanon, Syria and the Palestinian territories. Around 13,000 people work for UNRWA in Gaza, where more than two-thirds of the roughly two million residents are eligible for aid. The agency also says more than 200,000 Palestinians attend its schools in the Gaza Strip. Despite the removal of part of its foreign staff, UNRWA operations were continuing in Gaza, the agency said. Its director of operations and other international staff were remaining in Gaza, UNRWA said.